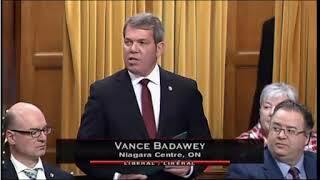 Added February 11, 2019 from Vance Badawey. Added December 7, 2018 from Vance Badawey. Added November 29, 2018 from Vance Badawey. Niagara as a Trade Corridor. Added June 5, 2018 from Vance Badawey. Added May 31, 2018 from Vance Badawey. 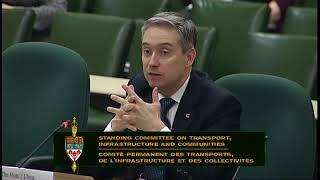 Another productive meeting of the Standing Committee on Transportation, Infrastructure and Communities, discussing, with Transport Minister, Marc Garneau and his team, Niagara’s role in contributing to Canada’s international trade performance with our strong International Trade Corridor assets. 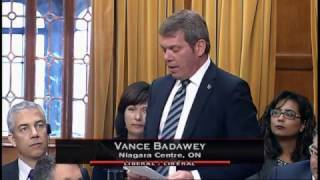 Added March 28, 2018 from Vance Badawey. Added March 1, 2018 from Vance Badawey. 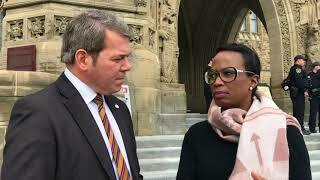 As Black History Month comes to it's conclusion for 2018, I spent some time with my colleague Celina Caesar-Chavannes to discuss the importance of Black History Month, inspiring black Canadian women, and ending racism. 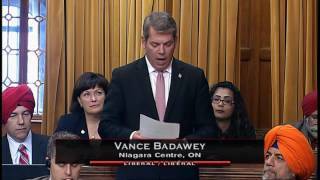 Thank you Celina for speaking out and being a voice for people across Canada! Added December 12, 2017 from Vance Badawey. Added December 8, 2017 from Vance Badawey. 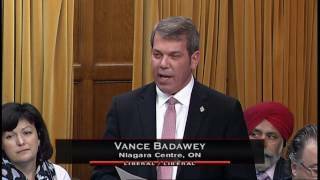 Yesterday I rose in the House to speak on Bill C-24 and why it is important that Ministers be equal and have equal representation. Added December 6, 2017 from Vance Badawey. 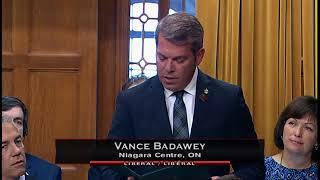 I rose in the House today to honour and congratulate four Niagara Regional Police Officers. Two weeks ago, I attended a service at Rideau Hall when Constables Daniel Bassi, Jake Braun, Neal Ridley, and Allan Rivet received Decorations of Bravery from the Governor General. On October 10, 2015, these officers subdued an active shooter in Fenwick, Ontario in the Niagara Region. While Constable Ridley negotiated with the distraught man, the man suddenly opened fire, hitting both constables Ridley and Braun. Despite their injuries, the officers, joined by constables Bassi and Rivet, were able to neutralize the threat, preventing the situation from escalating further. These officers go to work everyday to protect and defend the most vulnerable in our society, often at great personal cost. These men exemplify courage, bravery, and the best Niagara has to offer. I'd like to congratulate Constables Ridley, Braun, Bassi and Rivet for their Decoration of Bravery. 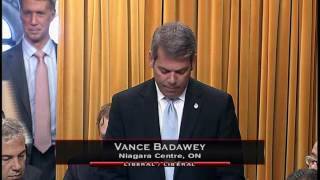 Thank you for helping to keep Niagara safe. Added October 17, 2017 from Vance Badawey. Mr. Speaker, Today is Marine Day. A day to celebrate Great Lakes – St. Lawrence shipping. The Chamber of Marine Commerce is here celebrating with us on Parliament Hill today. It may surprise some to learn that Great Lakes – St. Lawrence shipping contributes 227,000 well-paying jobs to Canada’s economy while moving 160 million metric tons of cargo. Annually, Great Lakes – St. Lawrence shipping brings in $35 billion in business revenue and contributes $5 billion in tax revenues. In addition to a stellar safety record this method of shipping also results in an 84% reduction in carbon emissions versus trucks and trains. In the Niagara Region, the marine industry plays an integral role in the regional economy. 40 million metric tons of cargo passes through the Welland Canal annually on over 3,000 vessels. 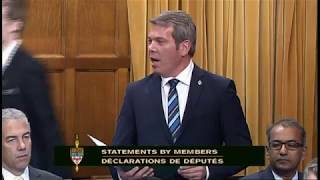 Mr. Speaker, I rise today to congratulate all the hardworking people in this critical industry who contribute so much to the success of Canada-U.S. trade. Added October 6, 2017 from Vance Badawey. 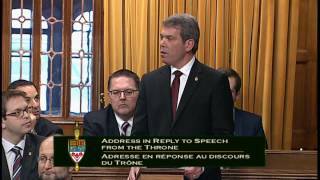 Today I rose in the House to speak about the 5th annual Moose Hide Campaign – a campaign that urges all men to speak out against violence towards Indigenous and non-Indigenous women and children. Five years ago, an Indigenous man named Paul Lacerte was hunting moose with his daughter along the Highway of Tears in British Columbia, where far too many Indigenous women and children have gone missing or been found murdered. At that moment, Paul thought to engage men in the fight to end violence against women and children by using moose hide as a symbol of commitment to honour and respect women and children. Now, more than 500,000 squares of moose hide have been distributed across Canada. I invite all Canadians to support the Moose Hide Campaign by proudly wearing a moose hide square, promoting gender equality and healthy relationships, and speaking out against gender-based violence. Added September 21, 2017 from Vance Badawey. 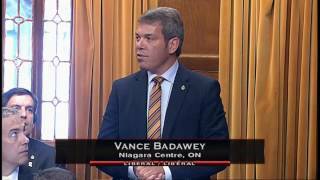 Mr. Speaker, I rise today to table a petition in the House on behalf of my constituents in my riding of Niagara Centre, particularly in the city of Port Colborne. The petition has been duly certified and calls for hospice palliative care to be a defined medical service under the Canada Health Act so that provincial and territorial governments will be entitled to funds under the Canada health transfer system to be used to provide accessible and available hospice palliative care for all residents of Canada in their respective provinces as well as territories. Added September 15, 2017 from Vance Badawey. 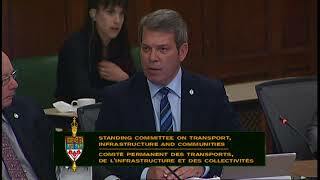 Yesterday, I was able to ask witnesses about Canadian ports, the St. Lawrence, and the Welland Canal. Added June 7, 2017 from Vance Badawey. Added May 15, 2017 from Vance Badawey. 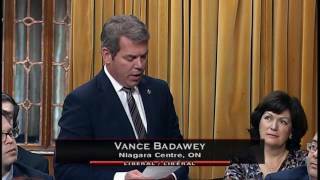 Vance questions the Minister of Finance, Bill Morneau, on the infrastructure bank and maternity leave in Budget 2017. Added May 3, 2017 from Vance Badawey. 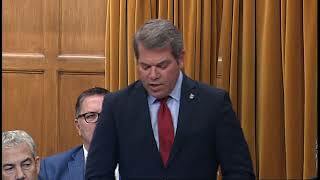 Mr. Speaker, this government has made it clear that it takes an evidence-based approach in its decision-making process. 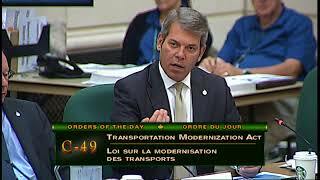 This is important to maximize efficiency and potential across this great nation of Canada. Our transportation network is no exception, and we need to be able to evaluate performance and make targeted investments. 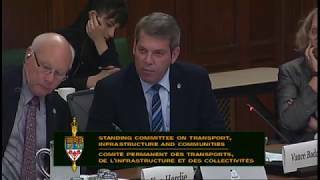 Could the Parliamentary Secretary to the Minister of Transport inform all Canadians on how the government intends to make our transportation network more efficient, with new innovative ideas and elements contained within budget 2017? Added April 11, 2017 from Vance Badawey. 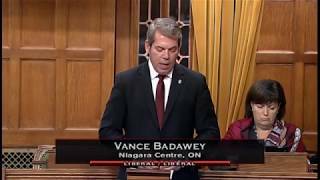 Mr. Speaker, I am happy to rise in the House to congratulate Welland's own Club Richelieu, celebrating its 60th anniversary. Part of Richelieu International, Club Richelieu in the city of Welland was founded in 1957, serving as a social club for Welland's proud francophone community. The club's founding members set out to develop an organization that was not only committed to preserving the French language and culture in the region of Niagara but also dedicated to helping those less fortunate and working with youth and senior groups in the community. Over the years, Club Richelieu's members have donated more than a million dollars to community groups and non-profit organizations. They operate a long-term care facility and a seniors' apartment, both of which cater to the francophone community, and they host countless community events. Francophone culture is alive and well in the Niagara region, thanks to the efforts of many dedicated volunteers at Club Richelieu. We thank them. [Translation] I want to thank all the volunteers for their work. Congratulations. Added April 10, 2017 from Vance Badawey. 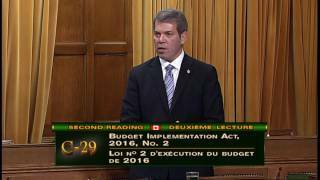 Mr. Speaker, many communities worked hard through the consultations this past year when the budget was about to be announced. We heard loud and clear about the need for environmental strategies. We heard loud and clear about social strategies and the need for a national transportation strategy and an infrastructure strategy to satisfy a lot of the recommendations coming forward at the local level, the grassroots level, for community improvement and growth plans. 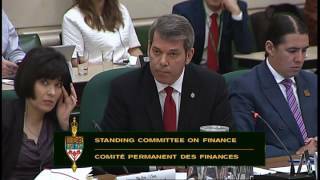 This year's 2017 budget identifies and recognizes a lot of those comments we heard. Could the member give us some feedback on how sustainable this funding will be well into the future? 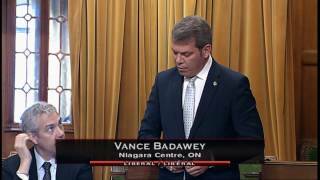 Added March 7, 2017 from Vance Badawey. 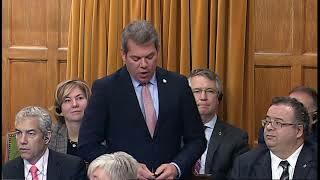 Thank you, Mr. Speaker. The people of Niagara have lost a hero and a legend. Mr. Ed Carter-Edwards passed away on February 22nd in Grimsby, Ontario. A Second World War veteran, Ed’s story reads like a movie: Enlisting with the RCAF at 19, he served with 427 RCAF squadron as a wireless operator. Shot down in 1944 and captured by the SS, he was sent to Buchenwald concentration camp. Saved by hospital workers, risking their own lives, he was later smuggled out by German aircrews and sent to a POW camp. After the war he returned home to Niagara to raise a family. Despite everything he had been through, he never lost his sense of humour and was happiest when bringing joy and laughter to those around him. He saw the worst of humanity, but he never lost his belief in human kind – and that is the lesson, and the legacy, of Mr. Carter-Edwards. To his wife Lois, and his family, I can only say thank you for sharing Ed with us all. 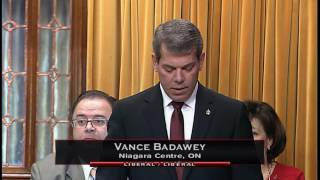 Added February 23, 2017 from Vance Badawey. 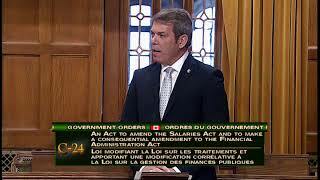 Mr. Speaker, what do Guy Carbonneau, Shayne Corson, and Wendel Clark all have in common? They, along with several other NHL alumni, will be in Niagara Falls this Friday participating in the Hotel Dieu Shaver Foundation second annual Celebrity Ice Cup tournament. This tournament, which mixes former NHL all-stars with recreational players, has raised over $115,000 so far this year in support of the Hotel Dieu Shaver Health and Rehabilitation Centre. This cutting-edge specialty health care facility excels in providing rehab, complex care, and geriatric services throughout the Niagara region. From teaching people how to drive a car with a prosthetic to helping individuals diagnosed with Parkinson's disease, to stroke rehab and palliative care, the dedicated staff at Hotel Dieu Shaver work tirelessly to help their patients and their families live life to the fullest. As a strong supporter of Hotel Dieu Shaver, I want to express my true appreciation to the organizers and all participants, as well as wish them the best of luck, and congratulate them in helping to support such an important Niagara organization. 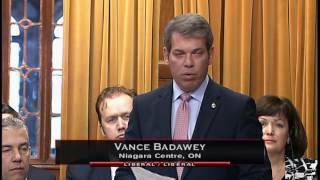 Added February 1, 2017 from Vance Badawey. 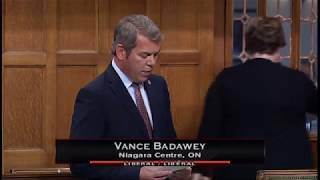 December 11th, 2015: Mr. Speaker, next Tuesday, December 15, the Welland minor hockey midget teams and people across Niagara Centre will be dressed in purple to remember the life of Julia Turner. Julia tragically lost her life to cancer at the age of 15. She was an avid hockey fan, and every year her friends come together to play in the Julia Turner Hockey Night in Welland in her memory. Throughout her community, Julia was committed to helping those who were less fortunate. To celebrate her life and her work, everyone is asked to bring a non-perishable food item to donate to The Hope Centre in Welland, Ontario. I would like to thank the organizers of the Julia Turner Hockey Night in Welland, especially her family and friends, for their heartfelt tribute to a remarkable young woman. 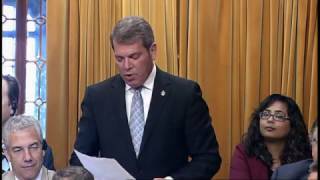 In the spirit of Julia's dedication to helping those in need throughout her community, I would like to remind all members of the House, people throughout the community, and all Canadians to think of those less fortunate as we enter the holiday season and to support their local food bank. 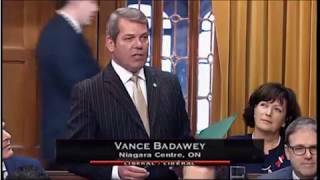 May 11th, 2016: Mr. Speaker, the Niagara region has lost a true leader. His Worship Stan Pettit, the former mayor of the township of Wainfleet here in the province of Ontario for 28 years and a champion for his community, passed away suddenly. Our thoughts are with Shirley, Stan's wife, as she and our entire community mourn Stan's passing, while also celebrating the full and inspiring life he had led. 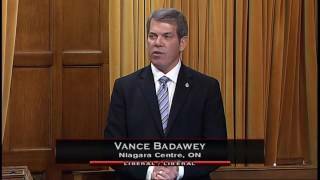 His passion and commitment to his constituents ensured that the township of Wainfleet was well represented, especially at Niagara regional council. Stan's passion was to build a sustainable and prosperous community, one which provided opportunities for younger generations to stay and live in Niagara. This vision drove him and motivated all of those who worked with him on a daily basis. I stand here today to thank His Worship, Mayor Stan Pettit, for everything he did for his community and the Niagara region. We live in a better place because of him and his contributions will be everlasting. September 28th, 2016: Mr. Speaker, young leaders from 196 countries will join global icons for the 2016 One Young World Summit, starting today. This annual event's visit, the first in Canada, features top young talent from the world of business, entrepreneurship, policy, social business, and media. Over the next four days they will engage on some of the biggest issues facing our world, including the environment, global business, human rights, indigenous reconciliation, education, peace and security, and mental health. They will be joined in these discussions by global figures, including Kofi Annan, Professor Muhammad Yunus, Sir Bob Geldof, Emma Watson, and dozens of others. Together they will formulate and share innovative solutions for pressing issues facing the world. 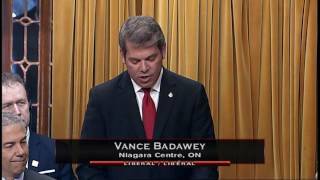 I encourage all MPs to take the spirit and inspiration of One Young World Summit back to their ridings, as I am for Niagara Centre. Our youth council meeting is being held in October, empowering our future leaders. We in Niagara are Ontario's first designated gateway, the first ever in the province of Ontario. Just recently, the federal government designated Niagara as Ontario's only designated foreign trade zone, the intention being that local planning and economic development activities include considering how to promote increased opportunities for cross-border trade, the movement of goods, and tourism in Niagara.